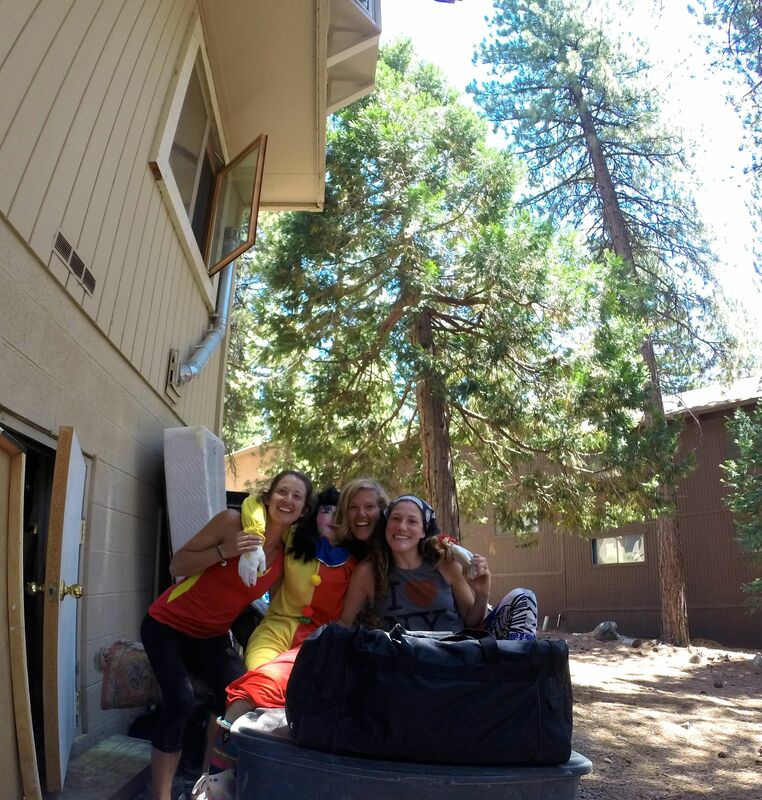 With great anticipation, we arrived in North Lake Tahoe’s Incline Village to meet up with Mick Dodge, again. He invited us to stay with him and Jacquie, or as he calls her, “Moonhair.” She works designing clothes for his show as well as with Sustainable Tahoe. Mick knew it would be a perfect connection while he was in the area training for the show. We pulled up around dinnertime and were greeted very warmly by Mick, Jacquie, and their little community. We felt part of the family the moment we arrived. Mick shared BBQ ribs that were flown from Texas from a fan, and we all got to know each other over dinner. Before dessert, we set up camp in the wooded backyard. At the end of the night, it felt great to be in bed, under the stars and soaking in the moment. We started the next morning by being invited to join Mick and Jacquie for their morning routine. We were more than honored, so we rolled out of the tent by 7:30 a.m. and piled into the car. Mick treated us to coffees. 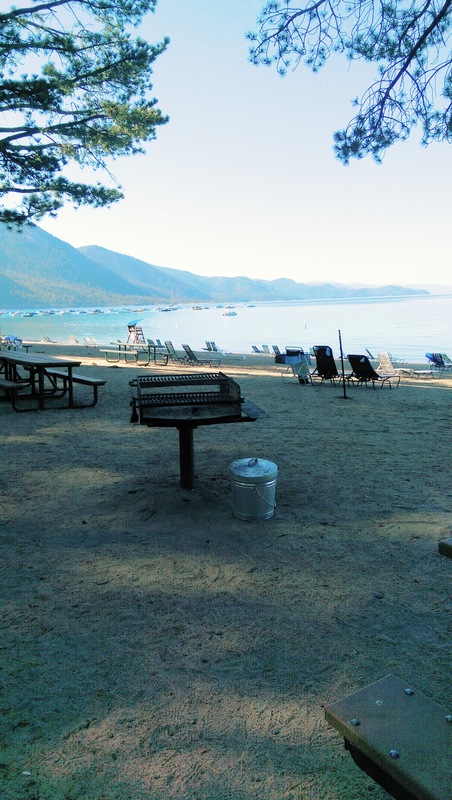 We entered Incline Village’s private beach area just in time to get in free. 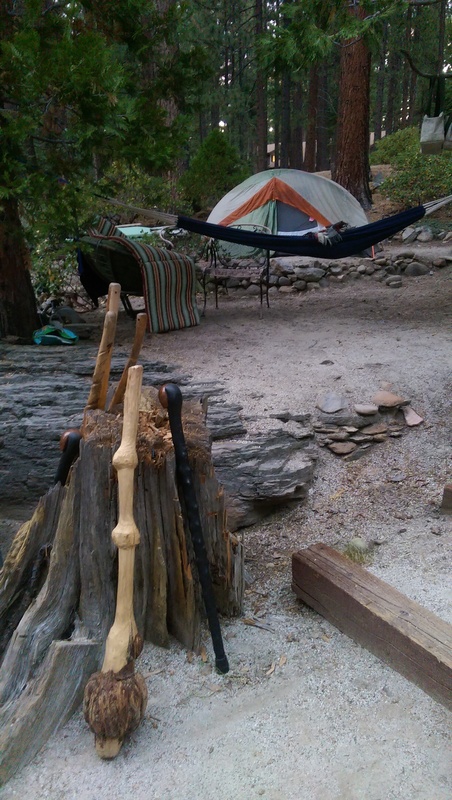 With not many people around, we unloaded the equipment, walking sticks, clubs, hammers, straps, and rocks. 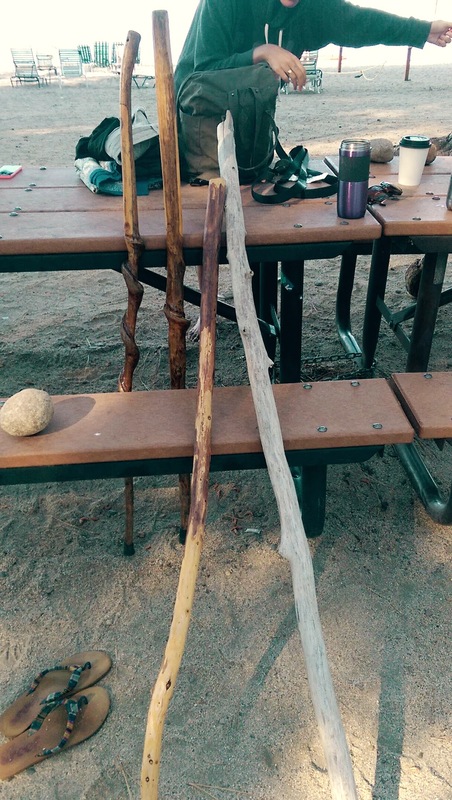 We were told to grab a stick and Jacquie lead us through a series of stretches with the tree as the guide. We then incorporated rocks we found in the dried creek nearby. She told us to flow with the rocks in figure eights and circles, mimicking the flow of life. Jacquie’s background allows for fun workouts as she used to be a belly dancer while Mick creates the stretches and routines. 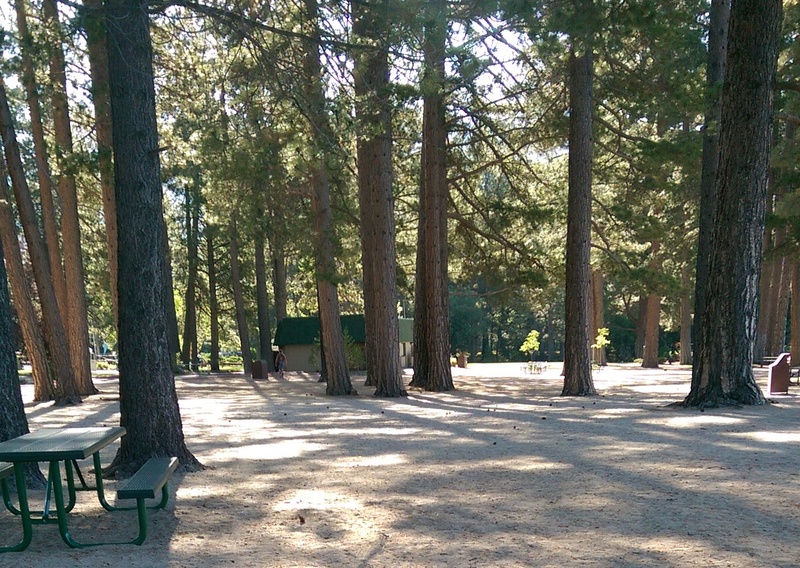 This is the Earthgym. 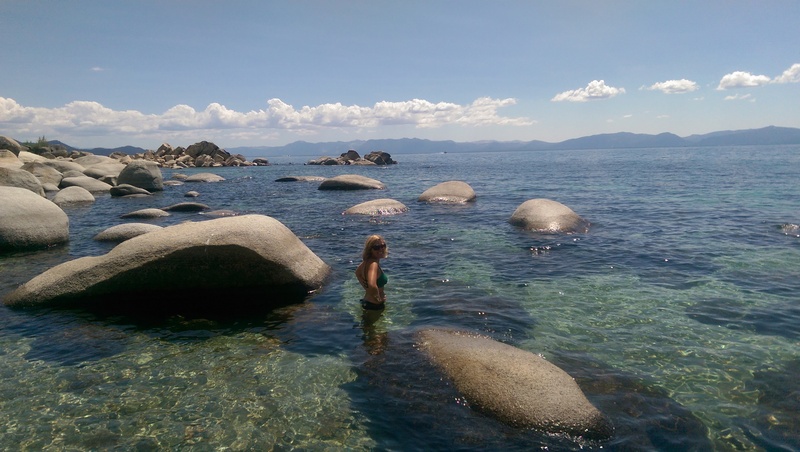 When we were done, we ran down to the water and washed our rocks before jumping in the lake. We warmed up by running in the water and swimming some laps. It was a perfect end to the morning workout– cleansing ourselves, starting fresh and watching the crystal water ripple with the reflection of the sun. Jacquie reminded us this is everyone’s oasis but this is Mick’s temple. She passed down some wisdom as well– if we all love that tree then we will all fight for that tree to live or in this case fight to save the lake. This 99.99% pure water unfortunately depletes every year and for the first time this year it has dropped below its natural level. Jacquie is behind the movement to try and do her part in saving it. 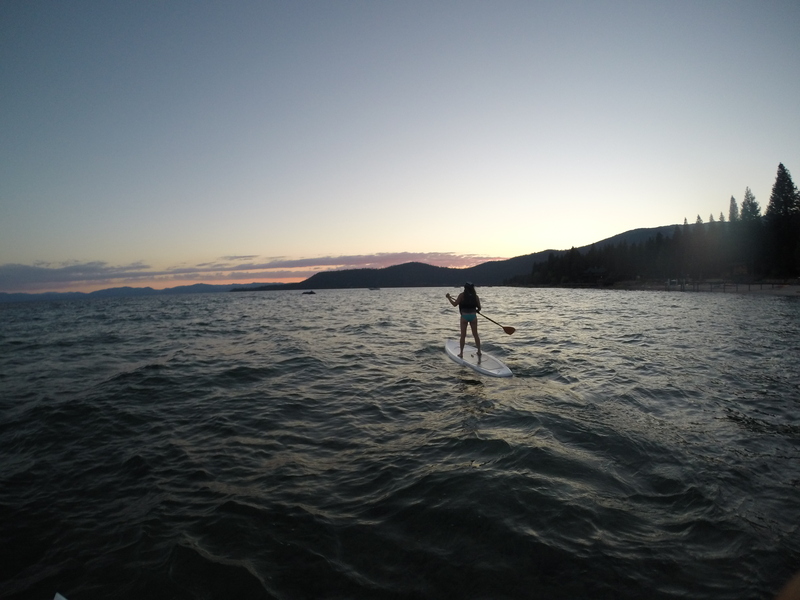 She is getting locals and tourists to drive less and enjoy transportation by biking, hiking, paddle boarding or maybe one day by ferry. A young woman, Stephanie, was moving out of one of Jacquie’s other properties that day. In true Gypsy Giver fashion, we all formed together to help her move her stuff. 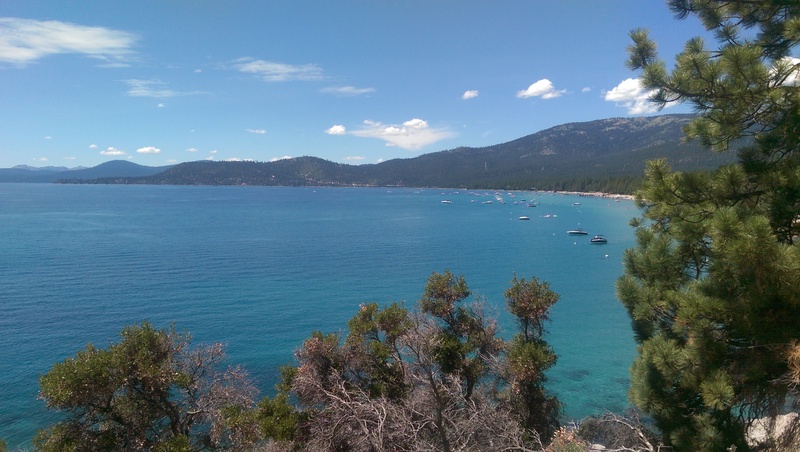 Stephanie is just like us living a nomadic life, coming from the east coast, spending time in Mexico, and falling in love with everything Tahoe. 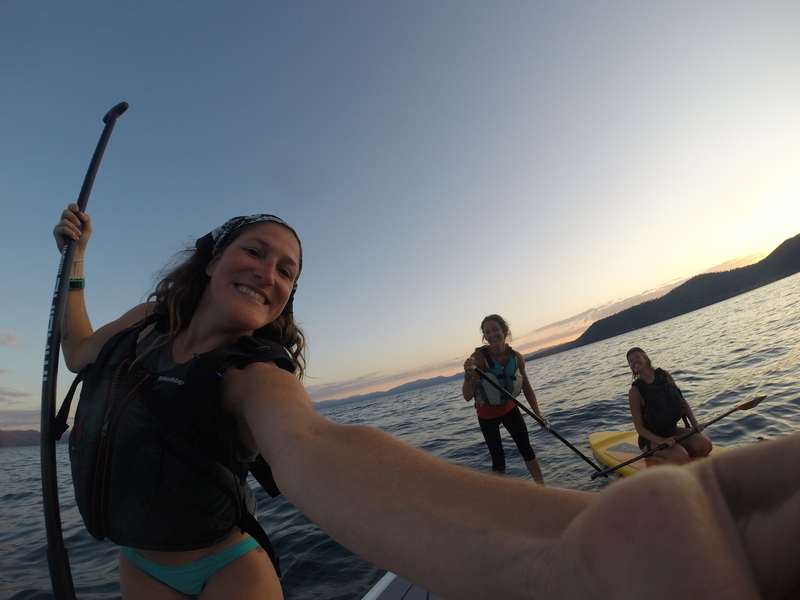 We had an instant connection and she invited us to go out paddle boarding with her that evening. We were honored to make so many new friends in one day! While we were getting ready to clean up the beach, Ruth, a housemate of Jacquie’s, who is also a screenwriter, brought out three of her books for us to indulge ourselves in. She helps people with their vibrations and finding their inner light. We can’t wait to dive into her lessons. As we spoke with Ruth we connected through our feelings and experiences. We continued on to Hidden Beach about a mile and half down the road. 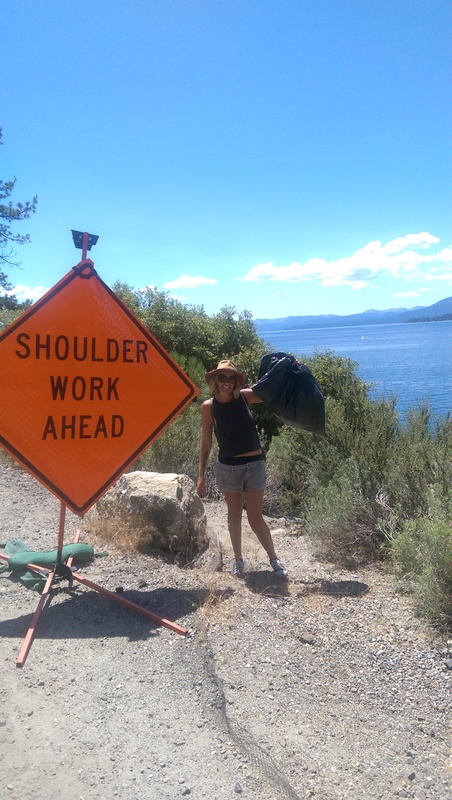 We walked the trail along the road to the beach while cleaning up trash along the way. We rewarded ourselves with a dip in her beautiful, clear waters. 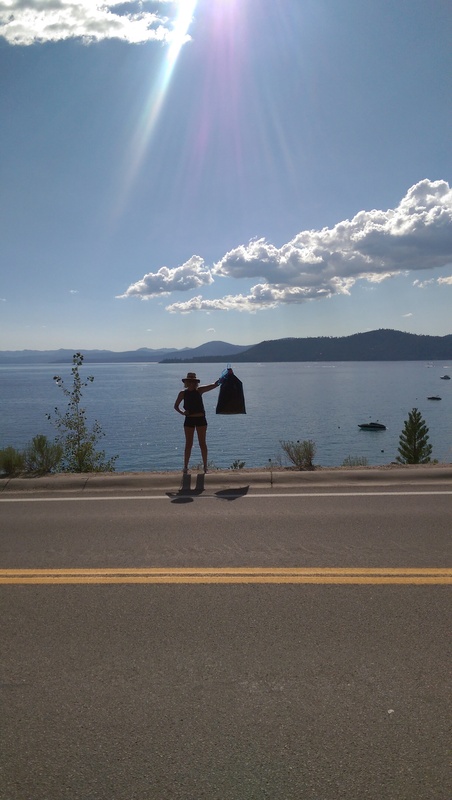 Between our hike there and back, a half hour each way, we picked up 161 cigarette butts and a large bag of garbage. We couldn’t even get to all of it because some of it was on cliffs. We can’t imagine if all that garbage went into the lake! 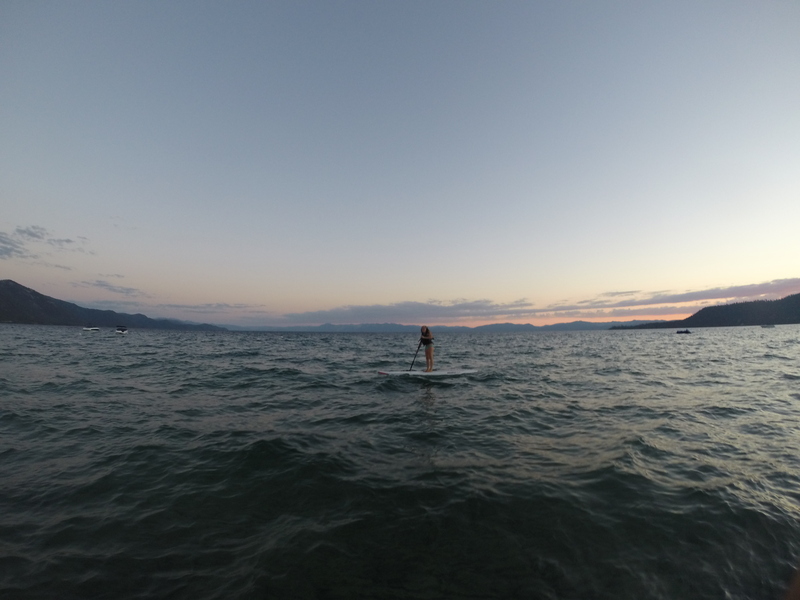 After dinner, we met Stephanie across the street for our sunset paddleboard session. 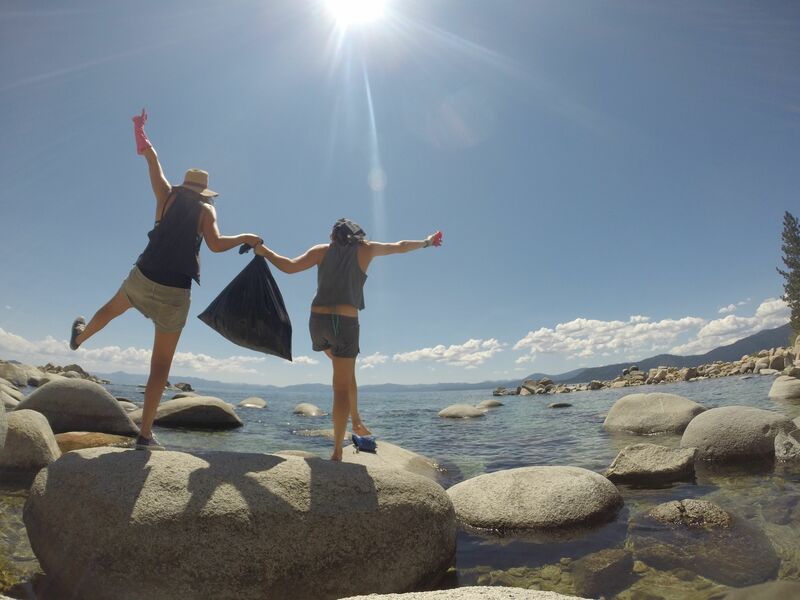 We had so much fun and still managed to pull pieces of trash from the waters that floated by us as we paddled. We are so thankful to Mother Nature, her beauty in her purest form and our ability to take part in preserving it. She supplies us with all we need. We can only hope we can inspire others to desire less of the material items and see that being outside, breathing fresh air, and giving it back to the trees are all part of the circle of life. We reflect on the awesome day we had helping out and are grateful for meeting some of the most inspiring, powerful, and knowledgeable people. We look forward to another day helping out and leaving behind only a footprint.